In 1900, Montana had an estimated 5,000 elk statewide. It was a bleak time in wildlife conservation, one in which hunters had scant opportunity following decades of market hunting, habitat degradation and little enforcement of the game laws on the books. Today, Montana has an estimated 176,000 elk throughout the state. Hunters can take two per year. Deer, antelope and numerous other game species have been brought back to abundance, with good hunting opportunity and enough game for hunters to fill freezers down the block. It didn’t just happen. It was hunters, landowners, wildlife biologists and public land managers who worked together to restore our wildlife. It took regulations and financial investments in scientific wildlife management. Most of all it took habitat protection. Montana began the great experiment in wildlife restoration by recognizing that some key places were best suited as wildlife habitat. The first effort to protect what is today the Sun River Wildlife Management Area began in 1913, and was a watershed that set the course for decades. The area abuts what would become the Bob Marshall Wilderness, and provides important winter forage when elk need it most. Other WMAs followed through the years. The Wall Creek, Dome Mountain and Beartooth WMAs came years later, all of which were strategic land purchases of vital winter range for deer, elk and other big game, as well as habitat for numerous non-game wildlife species. These efforts on the state level occurred at the same time that protection of federal lands for wildlife was gaining steam. Montana has abundant National Forests, Bureau of Land Management and other lands that are excellent wildlife habitat and provide world-class hunting, fishing and wildlife watching. All of these efforts have benefited from a host of federal and state programs that protect public land and public access. At the state level, the Habitat Montana program has been crucial for decades. In addition to acquiring new public land, this program has also funded easements to keep working farms and ranches in operation. While some politicians oppose Habitat Montana, the overwhelming majority of Montanans want to see more, not less, spending on public land, conservation easements, and access. The most important program at the federal level is the Land and Water Conservation Fund. This program, now more than five decades old, uses offshore oil and gas royalties to fund land conservation and recreation facilities. It’s used to purchase new public land, helping protect habitat, improve management and improve public access. It also pays for parks and playgrounds and numerous other recreation areas. Every county in Montana has benefited from LWCF. Montanans have a much better quality of life because of the LWCF. Unfortunately, the program is going to expire on Sept. 30. We need Sen. Jon Tester, Sen. Steve Daines and Rep. Greg Gianforte to step up and take action to get this program reauthorized and fully funded before it is too late. 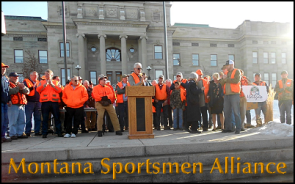 Montana’s wildlife, habitat, and hunting heritage depend on protection of public land. Our future depends on our leaders listening to Montanans, and not letting programs like the Land and Water Conservation Fund and Habitat Montana get sabotaged by political games.